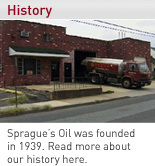 Sprague's Oil Service, Inc. is a family owned and operated company that has been servicing homes in the Monmouth, Middlesex, and Ocean area counties (New Jersey) since 1939. Our courteous, safe drivers will deliver heating oil to your home when you need it. (732) 566-0821) or set up a Sprague's Oil Charge Account. Sprague's Oil Service, Inc. also offers its Residential Heating Oil Customers a comprehensive Customer Service Package. This package is designed to take the worry out of heating your home. By signing up for the various components of the plan our customers are guaranteed a warm, cozy house all winter long.